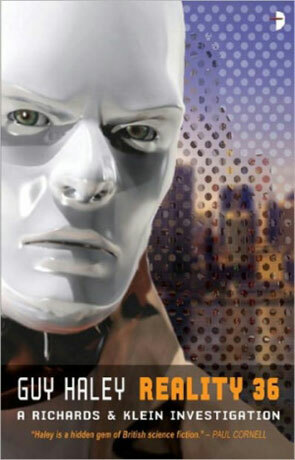 Richard is a Level 5 Artificial Intelligence and a Private Eye, his partner a German ex military cyborg named Klein. Their newest case takes them on the hunt for a killer who has jumped realities, hiding in the artificial construct of Reality 36. Unless Richard and Klein can stop him his powers could become godlike and threaten all the realms. It's amazing just how fast technology is progressing, we can hold in our hands more power than the fastest computers on the planet were capable of just 20 years ago and this progress see's no sign of slowing. Jump forward a little over a hundred years and we arrive at the world of Richard and Klein, a future where Artificial Intelligence has not only reached sentience but far outstrips the ability of the organic mind. A world where there is no longer just one "reality" but dozens and the line between the real and unreal, artificial and organic has become very blurry indeed. The book is very much a post cyberpunk detective story and one that has been written by an incredibly talented author - this is another Angry Robot publication and boy can they pick their novels! The story follows two arcs that run parallel to each other - one following the intrepid detectives and the other a very interesting character named Veronique. The characterisation is flawless and the authors ability to humanise an AI construct while retaining the characteristics of an artificial being is nothing short of brilliant, even the minor characters are perfectly drawn - The Paladin and Lion are good examples - both memorable and intriguing. The backstory is handled well, there are no massive infodumps to derail the pace and the use of exposition is kept to an absolute minimum - we get enough data to bring the world to life and learn more as we delve deeper into the different realities. Meanwhile the story is compelling, intriguing and complicated enough to keep you guessing through most of the book. Despite my fondness for technology, I am often cautious about picking up novels that are largely based on software constructs, I have found in the past that many authors haven't been able to adequately describe something that is inherently "virtual" and in an effort to encourage the reader to relate this to the real world they replicate the same conditions. I saw a good example of this problem while watching television with my young son, it was a new Teenage Mutant Hero Turtles series and in this episode they "digitised" themselves to rescue Splinter and Fight Shredder however all that really happened was they changed colours, became a bit "pixilated" and could do a few things they couldn't in the "real" world. I know that the kids must still be able to relate to what's going on whenever I see that I feel cheated, like someone's just not used their imagination to visualise how it could really be, a good example of the way it shouldn't be done. The author here though has been handled it perfectly - at no point did I lose the plot or feel that I was being bamboozled - there is also no technobable and as a result the narrative is both easy to read and set at an energetic pace. The cyberspace itself feels very much like a 21st century vision of Gibson's classic, complete with the ability to really die in the artificial realities - the characters even make use of a physical "jack in" point. Reality 36 is more immersive than virtual reality and more intelligent than Deep Thought - it is an utterly modern post cyberpunk detective tale and a damn fine read. Written on 17th August 2011 by Ant.